pink pony with purple hair. 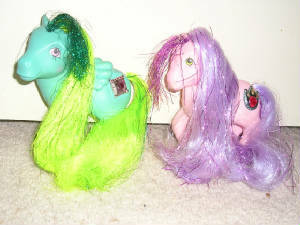 Both of these ponies came with a wand, crown and brush. There are many other ponies in this collection. Flutter ponies are quite small when compare to a normal earth pony. Flutter ponies are just a tiny bit bigger than a baby mlp. 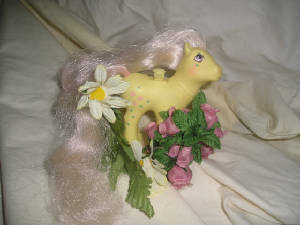 This pony is called Rosedust she is a yellow pony with pink hair and used to have plastic wings, Rosedust has pictures of roses going most of the way down her leg. There are many more ponies to this collection. Clever Clover was named after this site. and is actually a boy pony. 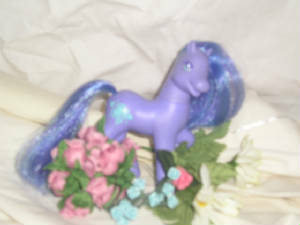 the ponies of 1997 have moved to my second website. these ponies are the sunny garden friends. from left to right Lightheart,sundance(1 set) and Sweetberry.